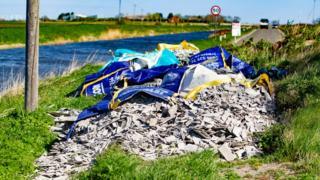 A costly clean-up operation is under way after 12 large bags of asbestos were dumped illegally on a river bank. The overflowing sacks, from several different builders' merchants, were found near Manea in the Cambridgeshire Fens. It is thought the waste - which will cost Fenland District Council "several thousands of pounds" to clear - was dumped at some point on Sunday. A council spokeswoman said: "The scale and audacity of the crime is shocking." The bags of asbestos - thought to weigh about 12 tonnes in total - were found next to the river at Byall Fen Drove, where the Sixteen Foot Bank meets the Forty Foot Bank. "Exposure to asbestos can also be a serious health hazard," the spokeswoman added. "We are working with our partners, including the Environment Agency, to investigate the incident, gather evidence and ensure the waste is removed as quickly as possible. "Witnesses are key to helping us identify who is responsible and we would appeal for anyone with information to get in touch. "We are committed to catching those who fly-tip in our district and would urge people to report any such activity that appears suspicious."